What’s in a name? 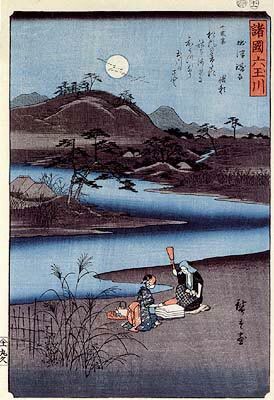 Today’s subject isn’t any particular place name; it is a term used for famous places as described in an essay on viewing Japanese prints, like ukiyo-e. There is, after all, a long and rich tradition of Japanese wood block printed graphic art of interesting place, such as in the Edo (modern Tokyo) area. The context of meisho-e should be explained further. Meisho, literally “place with a name,” is a term often translated as “famous places” or “celebrated locations.” The earliest known meisho-e were probably painted as a sub-genre of early yamato-e (“Japanese painting”) and were first linked as well toshiki-e (“pictures of the four seasons”) and tsukinami-e (“pictures of the twelve months”). …This furthers what I call the “Japanese as a language spoken by space aliens” meme. In other words, Japanese is a language with literal meanings absolutely incomprehensible to the Western mind that only Martians could comprehend. This is laughably false, because the premise above simply isn’t correct. In Japanese language, 名 (mei) is indeed used for what we would call name, but it means more than that. It means your reputation, renown, and fame; in other words, not just the name, but what is associated with that name. So, 名前 (namae; reputation + front) is your name, but it also means the reputation that precedes you. Something that is 有名 (yuumei; have + reputation) is famous because it has a reputation attached. A 有名人 (yuumeijin; have + reputation + person) is a famous person, like Elvis. For these reasons, a 名所 (meisho; reputation + general place) is a place of renown, a well-known place, a famous place. Incidentally, the kanji 場 (ba) tends to indicate a specific place rather than a broad one. This is a nuance that is easily missed. For instance, a 急所 (kyuusho; critical place) uses a kanji usually used for “urgent/ emergency” plus “general place.” This describes, in abstract, the vitals, or vital spots that can be struck for grievous damage. This applies to martial arts, as well as to Monster Hunter video games. While not the same language as 弱点 (jakuten; lit. “weak point”), it fulfills much the same linguistic function. On the other foot, 足場 (ashiba; foot + specific place) is used for foothold, often in the specific sense of scaffolding (i.e. something you place your feet on to reach high places without falling). It could also be used in a slightly more abstract way, such as a beachhead gained by landing forces during the invasion of Normandy in WWII. Similarly, an 売り場 (uriba; sell + specific place) is the specific place where you sell something, like a store counter. 場所 (basho; specific place + general place) describes a location. So, let us not consider famous places to be a matter of standing on top of a particular stone; they are areas, and famous, well known areas at that; places of wide renown. It’s not about having a name. It’s about why a place has a name to begin with. This entry was posted in Culture, Japan, Tourism, Ukiyo-e and tagged famous places, history, Japan, Japanese, Japanese prints, language, Tourism, ukiyo-e. Bookmark the permalink. I can add one more example about “mei”. “彼は　チェスの　名人　です” means “He is a master of chess”. We can use “名人” although he(she) is not “有名人”. I guess in earlier meaning “名” of “名人” was near to “名” of “有名人”, the meaning has changed. I think the meaning hasn’t changed so much, except that 名前 is so ubiquitous with Westernized record keeping that it has become ordinary through its use. I think that when your cliched hero goes, “I have no name for the likes of you!” or something (名乗る名前はない、など), it’s dragging “name” back to a more notable level. I try to English writing again. My English is so sorry. We use “名人” for the master. When we use “名人”, we don’t care if the master is “有名人”. The meaning of “名” of “名人” is guessed that it was equal to “名” of “有名人” in earlier. As you say, “名” of “有名人” is famous. It implies “well-known-in-public”, and “good”. Especially, the former is quite important for “名” idea. But now “名” of “名人” means just “good”. It doesn’t need any public reputation. I think this meaning is derived from the original one. In this meaning, there are some other words. These words don’t need public reputation, especially the third. Sorry not derived, but separated. Well separated, as you say 🙂 I understood anyway. Same kanji, different meanings.